A city planner confirmed that the developer of this planned project has withdrawn his request with the City of Phoenix to rezone the property, adding that the request would not be be moving forward to the city’s Planning Commission or City Council. The story below remains as originally published. Suburban and rural residents have spoken loudly against a proposed residential development on 71 acres north of Anthem on New River’s doorstep. And, it’s become clear their voices matter. The opposition, on a mission to stop the high-density development of 286 single-family homes, cleared its first hurdle when the Rio Vista Planning Committee surprisingly voted 6-0 at its Sept. 11 meeting to deny the rezoning request. “Community voice is a loud voice,” New River resident Laurie Ricci said following the meeting. Ricci, who has been actively involved in the fight against the rezoning case, has collected 1,300 signatures in an online petition against the proposal. The nearly 100 residents who attended the meeting at the Goelet A. C. Beuf Community Center on Pinnacle Peak Road, broke into applause and cheers with the decision. But they know more obstacles lie ahead. The Rio Vista committee is the first layer in the approval process. The group provides guidance and offers recommendations to the city’s planning commission, which will hear the case next, should the developer choose to continue the effort. Then the Phoenix City Council would make any final decision. 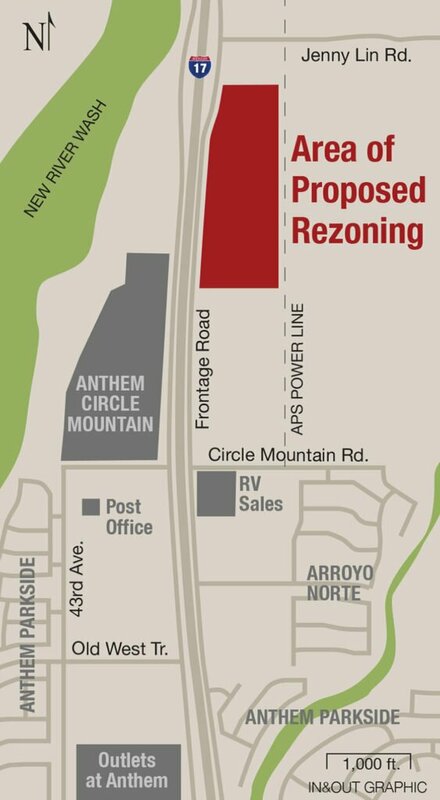 The committee’s decision to recommend denial came despite city staff’s recommendation to approve the proposed development, Valley Ridge Estates, located east of I-17 between Circle Mountain and Jenny Lin roads. The developer spent the last several months addressing a lengthy list of modifications and requirements imposed by the city, ADOT, MCDOT and the State Land Department. The city also amended its long-range land-use planning map in 2017, changing the property’s designation from commercial to residential to allow for 3.5 to 5 dwellings per acre. An expected increase in traffic volume along the frontage road topped the list of concerns voiced by meeting attendees from New River, Desert Hills and Anthem, as well as committee members. Results of a traffic assessment presented at the meeting showed the development’s potential to increase traffic from roughly 2,440 vehicles per day to 5,174, with more than double the traffic during morning and afternoon peak hours. Even with these estimates, the applicant’s representative, Jorge Villasenor, of EPS Group Inc. said, “Based on traffic counts [from the study] there is significant capacity available on the frontage road.” Villasenor said the traffic counts were collected within a 24-hour time period. However, those estimates didn’t sit well with audience members who pointed out the traffic count was completed on a Thursday before Labor Day weekend, which may not have not accurately represented traffic volumes. 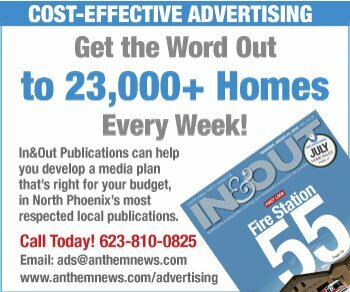 They also argued the study didn’t take into account the impacts to the Anthem Way and New River Road exits off I-17. 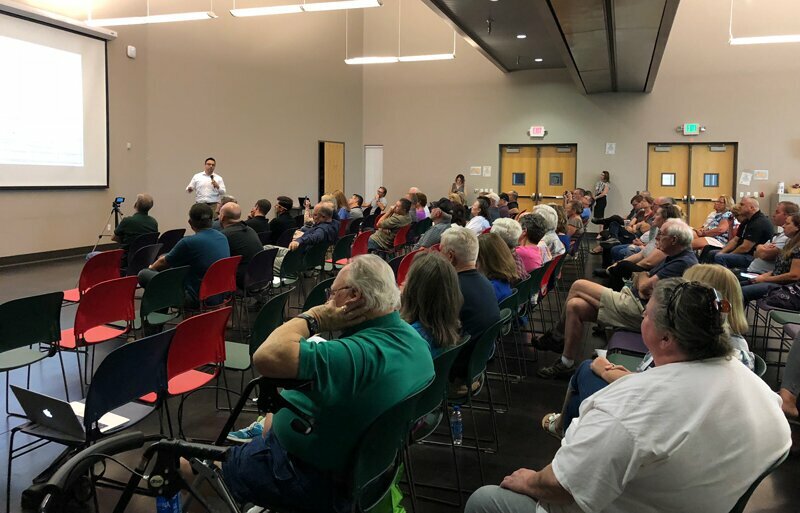 Other concerns expressed included the number of accidents on the freeway, which already causes increased traffic along the frontage road and Navigation Way in Anthem, as well as the impact accidents would have on emergency response times, which are already a source of concern. Committee chairperson Ozzie Virgil agreed. If the project were to move forward, MCDOT would require a more detailed traffic-impact study to determine if future roadway improvements are needed north or south of the project, and any potential improvements could be required to be made by the developer, said Kaelee Wilson, a City of Phoenix planner. Density of homes, effect on schools, police and fire services and preserving the area’s rural feel and dark skies continue to be concerns expressed by nearby rural and suburban residents, as well as Anthem Community Council. In the end it became evident that neighbor concerns were valid enough to sway committee members against the proposal. Before making a motion to deny the rezoning request, Rio Vista committee member Steven Scharboneau pointed out the sheer number of community members and representatives from organizations, including Anthem Community Council and Anthem homeowner associations that issued statements opposing the project. “I don’t think I was thoroughly impressed with the responses about the traffic statement, said Rio Vista committee member Loyd Nygaard. “I think the traffic on the frontage [road] and the results from that study were one thing, but how it affects the exits on New River Road and Anthem Way… I just don’t think those things have been addressed quite well,” Nygaard said. He also expressed concerns about emergency response times, dark skies and further impacts to Anthem’s privately owned parks and amenities. If the proposal is heard by the Planning Commission, the last step in the process would require City Council approval, tentatively scheduled for the Nov. 7 regular meeting. ← Can I Get a Hail Mary? New vs. Used Home: Which Should I Buy?